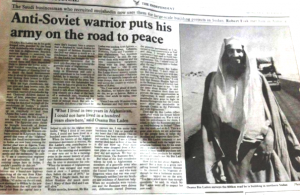 It was the United States who first created and used Al Qaeda in Afghanistan in the 1980s to down Russian aircraft and to fight Russian troops. 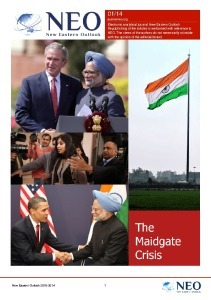 After successfully pushing Russia out of Afghanistan and plunging it into a sociopolitical dark age, the US went on to claiming to be victimized by the monster they themselves created, perhaps most spectacularly on September 11, 2001. Today, the US finds itself back to now fully using Al Qaeda to fight a proxy war against Russia, this time in Syria. 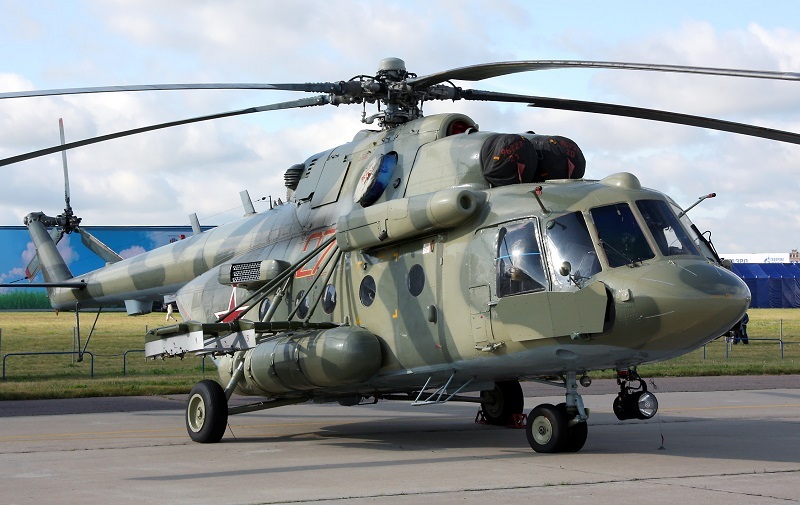 The Russian Mi-8 helicopter was conducting humanitarian operations. 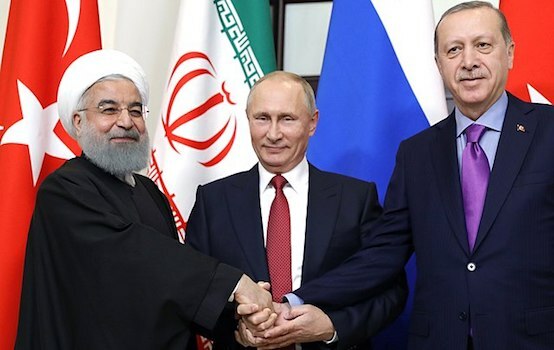 This is not according to only Russian or Syrian sources, but even opposition sources including UK-based anti-Syrian government proponent Rami Abdulrahman who refers to himself as the “Syrian Observatory for Human Rights” (SOHR). The Syrian Observatory for Human Rights, which opposes the Syrian government and tracks the conflict from Britain through contacts in Syria, said the helicopter had crashed near the village of Saraqib in Idlib Province. The aircraft had recently delivered aid to two Shiite villages nearby that have long been surrounded by Sunni rebels, the group said. Qatari-state media Al Jazeera, also an admittedly pro-militant voice amid the conflict, would admit that Idlib province, Syria, is held by Al Qaeda. Idlib is held almost entirely by a powerful coalition of hardline rebel groups, including the former al-Nusra Front, now known as the Fateh al-Sham group after renouncing its status as al-Qaeda’s Syrian affiliate. Despite Al Jazeera’s attempts to qualify Nusra Front as having “renounced” its Al Qaeda affiliations, it is still recognized by the US, Russia and Syria as a terrorist organization. In the immediate aftermath of the helicopter’s downing and now ongoing since, pro-militant pundits from both the public and Western policy centers, celebrated the incident. 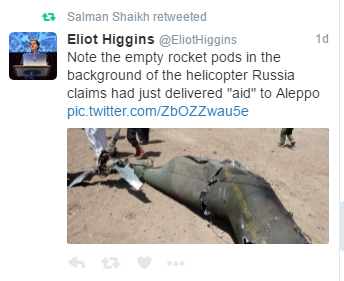 Former director of the Brookings Institution’s Doha Center, Salman Shaikh, repeatedly retweeted accusations that Russia’s Mi-8 was not in fact on a humanitarian mission, simply because empty rocket pods were found among the wreckage. With SOHR insisting indeed the Russian helicopter was on a humanitarian mission, the empty rocket pods were most likely empty upon take off. So far, “experts,” including Atlantic Council’s “Digital Forensic Research Lab Senior Non-Resident Fellow” Eliot Higgins, previously an unemployed British social worker and blogger, have insinuated the Mi-8 was on a military mission, but have yet to provide any evidence. This attempt to leverage supposed “experts” to justify the downing of a helicopter (and subsequent celebrations) engaged in humanitarian operations even in contradiction to media reports coming from both sides of the conflict, indicates just how far departed Western rhetoric has become from the principles it claims to uphold, particularly in regards to its involvement in the Syrian conflict and its backing of militant groups operating in Al Qaeda-held Idlib province. The downing of Russia’s Mi-8 over Idlib is not the first. Another Russian helicopter was shot down near Palmyra in early July. Two Russian airmen killed in Syria on Friday were shot down with American weaponry, the Interfax news agency said Sunday, quoting a Russian military source. 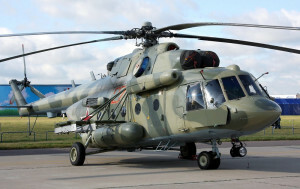 It said insurgents from the Islamic State group hit the airmen’s Mi-25 assault helicopter with a U.S.-made TOW heavy anti-tank missile, a weapon that uses guidance from a ground station. The possibility of terrorist organizations like the Islamic State (IS) ending up with US missiles should be no surprise. It is a “coincidence” it appears many US policymakers wanted to unfold in Syria, if a no-fly zone implemented over Syria by the US directly was not a possibility. I might do what we did in Afghanistan many years ago, to give those guys the ability to shoot down those planes. That equipment is available. It should be noted that the “guys” Senator McCain is referring to in Afghanistan were Al Qaeda. With the downing of 2 Russian helicopters at the hands of IS and Al Qaeda respectively, it appears very much like Senator McCain has (one way or another) gotten his wish, with Al Qaeda once again serving as the armed intermediary between the US and Russia. The end result is US foreign policy coming full circle, having created Al Qaeda to fight Russia in the 1980s, then using the terrorist organization as a pretext to extend military interventionism globally, to now once again cheering them on in Syria as they down Russian aircraft amid a struggle to restore peace and stability to both Syria and the wider region. One wonders if this irony is lost on the American people, who have been asked to sacrifice so much in the name of fighting “terrorism,” only to have those who have done the asking to ally themselves with the very terrorists in a destructive proxy war in the distant lands of the Levant.